Just because it’s my birthday doesn’t mean I want everyone to know. Everyone settle down. Just take it easy. Lets not get crazy. There’s no reason to act ridiculous. Calm down please. I know it’s my birthday and it’s hard to contain the insanity, but this year I want it to be peaceful. Call off the skywriters. Keep your exotic finery for yourselves this year. I don’t need another custom rap song written and performed by P-diddy. There’s no reason to buy me more diamond rings or thick gold chains – save your money for more worthy things like food and photographic items. Let’s not go overboard this year. I find that the older I get (37 today) the more I want to give things on my birthday and not recieve things. I wish to give great gifts. My birthday fanstasy is to put my wife and kids in a jet and collect all my friends and golf and surf and shop in Costa Rica. And I’d pay for all of it. Sounds good, no? Maybe someday. Don’t be surprised if you get this call from my “jetphone” on some future April 26th. You may be thinking “What’s with the photograph?”. Well, my mother commissioned a fine photographic studio by the name Olan Mills to document me at the height of my handsome powers. I am wearing sunglasses to keep my allure at a reasonable level. I thought you might like to see what I looked like at my utmost prime. A very HAPPY BIRTHDAY to you big bro!! I will look forward to a call going to Costa Rica…..sounds sweet! 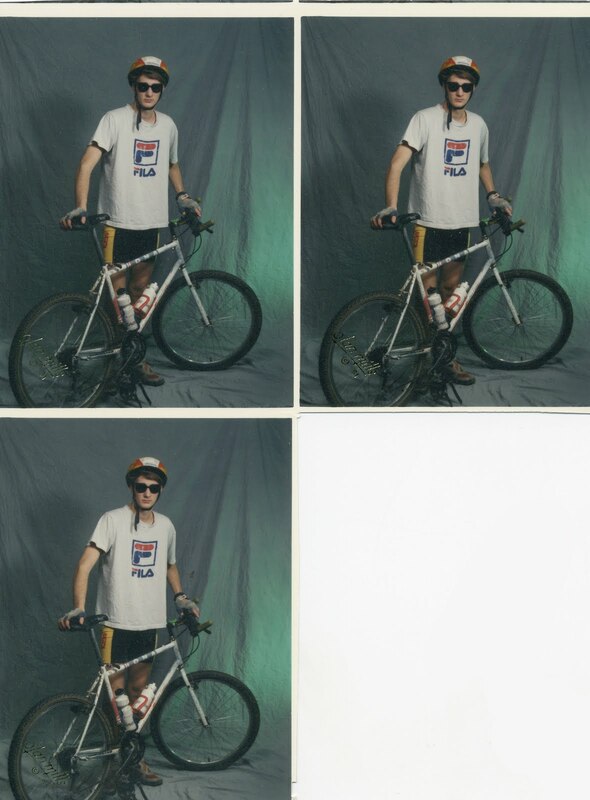 I totally remember the bike picture and this it captures the essence of you in your cool CHS days…..those glasses are totally in style! now everyone can see why you were a real ladies man, the ultimate stud-muffin and high-class dude…did I say “were?” oh…I meant ARE! have a happidy, dippidy, doo da birthday bro! Normally when someone documents (in a photography) the style that made them cool, and then displays that documentation 15 or 30 years later, that person looks awkard and rediculous. Its like the cooler you were back then, the more silly you look now. But in your case, Jon….. I see nothing but grace and beauty in this photograph. @ Aaron. Thank you. I agree. @Jane. How about Winco? $5. Happy FREAKING Birthday dude! I hope it’s a great one! I’d really like to see a 24×36 of that pic of you over your mantle…come on, it’d be awesome! Thats a good plan. Sam just might do it!